The Star-Crossed Side Table is an original design by world-renowned, award-winning Sean Dix and is available exclusively at Inmod. Its distinctive geometric base echoes mid-century modern influences, is lightweight & versatile and is constructed of responsibly harvested American hardwood. The Star-Crossed Side Table may just be the perfect side / end table. We love this table for so many reasons, and thanks to Sean Dix, who never skimps on style, the Star-Crossed Side Table draws from obvious mid-century modern and Scandinavian influences, yet in and of itself is a distinctly unique instant classic. Its architectural base is defined by intersecting pieces of solid wood that together create a complex yet perfectly symmetrical MC Escher-like form defined by opposites. Its wood base is both sturdy yet lightweight and is available in the FSC-certified American wood of your choice (Ash or Walnut). Its thick glass top is tempered for added physical and thermal durability in your home. The Star-Crossed Side Table design accents my other modern and contemporary pieces quite nicely .The glass fits very firmly on the legs and is secured by three clear tiny suction cups that fit perfectly in the design of the side table (they are so tiny and clear you don't even notice them). The walnut legs are exactly the color as described by Inmod and the circular glass is the correct thickness that I was looking for. ProsThe shipment was received on the day promised via Fedx and came in two pieces. The pieces were packaged very well and as I do on all shipments I inspected them very closely and found them to be flawless. I used a level to ensure that the table was level - and it was - the bubble was dead center in the middle. 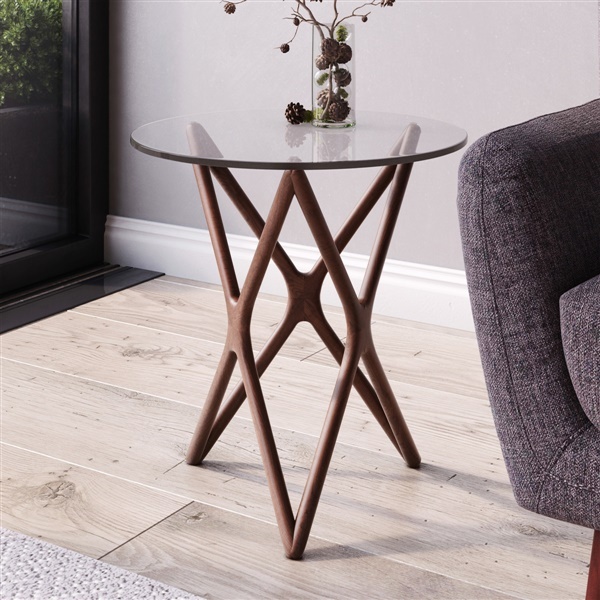 As I stated in the review headline," a simple and unique subtle design for a side table" - it emphasizes the natural and straightforward design of a side table without being ornate while the legs lend itself to its uniqueness and subtle design. Really unique design! It complements the plainer furniture in my apartment by adding a little razzle dazzle while still being sleek and modern - it's a great addition to my living room! indescribable how fantastic these tables look in my living room with the other furniture, just wanted to say a BIG THANK YOU to inmod! Paired these up with the star crossed coffee table, an awesome living room set ! Thank you! More lightweight than i thought! Surprisingly so as the top is thick and the base is strong and solid - impressed! looks great from all angles! The best addition to our family room so far! They were like magic in tieing the whole design of the room together! Incredible! Such a unique and incredibly interesting base design, i love this side table, THANK YOU! Placed in our family room, the star-crossed design really ties the sofa, the fireplace and mantle together. I bought two of these to go next to my couch and I'm so glad I did. ProsPerfect height and wood finish.